Kevin Smith Transportation Group is a Luxury Transportation company that services the entire Greater Philadelphia, PA area. KSTG delivers services daily in Bucks, Chester, Delaware, Doylestown and Philadelphia counties. This includes more than 300 cities, towns, boroughs and Providences across the area. One of the places a KSTG vehicle will regularly service is South Coventry Township, PA.
Kevin Smith Transportation Group delivers both Leisure and Corporate Transportation services in South Coventry Township, PA. KSTG’s Leisure division will often be seen sending out a Wedding Limo or Wedding Shuttle on most weekends. Service requests for a Limo or Party Bus for a Night on the Town or a trip to Philadelphia, PA for a concert or show is very common and popular for those who live in South Coventry Township, PA. The exciting requests for a Party Bus to the Manhattan Cruise Terminal or a night out at the casinos makes for a great night. If you are fortunate enough to work for one of the amazing companies in South Coventry Township, PA, then you may require the services of Kevin Smith Transportation Group and our Corporate Transportation division. Airport Transportation is a common service request with Philadelphia International Airport (PHL) located so close to South Coventry Township, PA. However, with nearly a dozen International Airports in the Mid-Atlantic area, many companies will utilize KSTG’s services for Airport Transportation to Newark International (EWR), Kennedy Airport (JFK) or other points north or south of the Philadelphia, PA area. Other Corporate Transportation services that Kevin Smith Transportation Group offers companies in South Coventry Township, PA include Shuttle Services. This may be needed for moving employees to local SEPTA stations for both their morning commute and returning home in the evening. KSTH Sprinters and Mini Buses are popular vehicles for this service. Some companies, with offices or clients around the country, often have employees traveling through local FBO’s. When Private Aviation is utilized, KSTG Cadillac XTS’s and Black Yukon’s are often seen transferring employees from their offices in South Coventry Township, PA to those local FBO’s including Northeast Philadelphia Airport, Doylestown Airport and Wings Field. 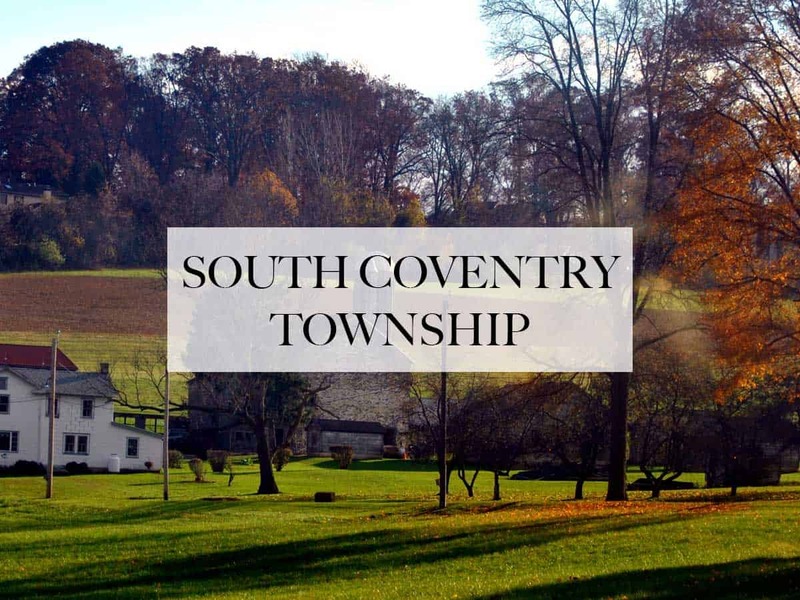 Many companies in South Coventry Township, PA have been pushed by their Senior Management or Counsel’s office to follow strict Duty of Care requirements with their employees. This means that the days of using an unregulated Black Car Service for Corporate Transportation services is no longer allowed. For Kevin Smith Transportation Group, this means that our Black Car Service division, including our fleet of Cadillac XTS’s, Black Yukons and Black Infiniti’s, are regular visitors to South Coventry Township, PA.
South Coventry Township, PA is a township in Chester County, PA. The population is estimated at 2,604. The township derives its name from Coventry, England, the native home of an early settler. Coventry Hall, Coventryville Historic District, Simon Meredith House, Stephen Meredith House, Nathan Michener House, and Townsend House are listed on the National Register of Historic Places. Coventryville’s origins lie in the iron forge founded in 1717 by Englishman Samuel Nutt, an early American industrialist and member of Pennsylvania’s Assembly in 1723–26. Named for his native home of Coventry, England, Coventry was the first forge in Chester County and was located at the confluence of the north and south branches of French Creek a short distance from rich iron deposits. In 1723, Nutt formed a partnership with Mordecai Lincoln (great-great grandfather of Abraham Lincoln) and expanded the operation to include two furnaces, Warwick and Reading. It was at Reading Furnace that same year that experiments led to the production of early steel. After Nutt’s death in 1737, Coventry passed to his nephew Samuel Nutt Jr. whose wife, Rebecca Savage inherited the site upon his death. Upon her marriage to Robert Grace, Coventry and Warwick were joined to become Rebecca Nutt and Company. It was Robert Grace’s close friendship with Benjamin Franklin that led to the popular legend of the Franklin Stove prototyped at Grace’s home, Coventry Hall. In 1757, Coventry and Warwick passed to Thomas Potts, Rebecca’s son-in-law and father of John, founder of nearby Pottstown. By the time of the Revolution Coventry had passed his brother Samuel and Thomas Rutter. It was under the Thomas Potts/Rutter ownership that Coventry and Warwick supplied munitions for the Continental Army. In the early 19th century, Coventry forge was enlarged and re-equipped and much of the present village was constructed. During this time, however, anthracite coal began to replace charcoal as fuel and new techniques for manufacturing iron and steel were developed. Smaller operations like those at Coventry and nearby Hopewell lay far from coal deposits and outside rail transportation centers and declined with only brief peaks in production during the American Civil War. Coventry Forge ceased operations entirely in 1871. The village today consists of structures dating from the early 18th century until the mid-19th including workers housing, the Inn, the ironmaster’s house (Coventry Hall) and the mid-19th century Methodist church. While the realignment of Route 23 to the south of the village in 1959–1960 obliterated a portion of the forge site, the Coventryville Historic District remains an intact concentration of original eighteenth and nineteenth century structures. The community was listed on the National Register of Historic Places in 1978. The entire team at Kevin Smith Transportation Group is proud of our partnership with every company, venue and person from South Coventry Township, PA who chooses KSTG as their #1 Transportation Company. We believe our priorities around luxury helps us deliver our services for everything from a once in a lifetime Wedding celebration to supporting our Corporate clients who require use of our Shuttles and Sprinters for a company event. With South Coventry Township, PA and KSTG working together, we are confident KSTG vehicles will continue to support the entire area for years to come.